This week our featured fanart is “Power and Courage” by deviantART artist lone-momo. The first thing that really stood out to me looking at this piece was the contrast: Link, bright and almost ethereal, facing off against Ganondorf, dark and engulfing. 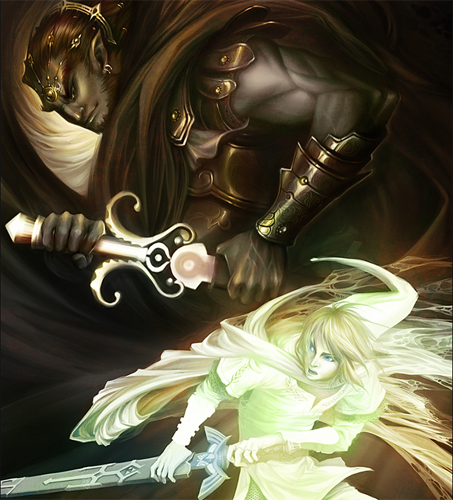 The composition is absolutely beautiful, as Link truly looks like a hero worthy of the Goddesses cloaked in an almost spirit-like cloak of light, whereas Ganondorf resembles the warped vortex of darkness that he truly is. In addition, the details on the armor and fabric and hair and all else is simply amazing. What do you guys think?